It's about the journey...: Barefoot running/minimalism-what are the facts? Throughout my history as a runner, I've probably tried nearly every shoe and orthotic imaginable. As I've written about before, I have a fairly lengthy running injury history that I've tried to address with footwear variations, with limited degrees of success. In reality, many of my injuries occurred due to strength imbalances and training and nutrition errors, so to blame shoes or orthotics alone is short-sighted. Still, as a physical therapist that enjoys treating runners, I have a responsibility to stay up to date on footwear and running trends. So, I figured I'd use this blog share a bit of information on barefoot running/minimalism trend, as sports medicine/rehabilitation research has begun to look more into it as the trend emerges (recovery rides are a great time to read an article or two)! Part of the reason this interests me is my own personal experience. In sixth grade, while playing soccer, I developed Achilles tendonitis, and was put in orthotics. I did fairly well with them throughout my high school career, until they began to wear out. I was given new, more built, rigid orthotics and stability shoes, and promptly flared up some arch and lateral foot pain-my feet were not used to being stretched out so much! I think I kept with them for a bit, but from there, my memory's a bit fuzzy. I tried a mix of custom orthotics, OTC, cheap Dr. Scholl's-type more flexible inserts, semi-custom molded orthotics, running store inserts, motion control shoes, stability shoes, etc, throughout the coming years. My feet are flexible and flat; I could be classified as an "over-pronator", even though I find the term a little too simplistic at times. Throughout those years, my injuries jumped from shin splints (freshman year of college), to patellar tendonitis (summer after freshman year), to peroneal tendonitis (sophomore year), to plantar fasciitis (junior year), to a proximal tibial stress fracture (senior year), to a nasty, nasty bout with ITB syndrome/patellofemoral pain (senior year-5th year), to a distal tibial stress fracture (5th year). Post-collegiately, I cycled through bouts of shin splints, posterior tibial tendonitis, more peroneal tendonitis, distal hamstring tendonitis, and finally, my ischial tuberosity stress fracture. Basically, if you could develop tendonitis somewhere, I did. So, obviously, nothing worked consistently. The funny thing was, no matter what sort of injury I had, I could without fail always put on my racing flats or spikes and run a workout or race without pain (except for the stress fractures; those were a different breed). I always chalked it up to the physical pain of running harder masking any sort of injury pain; but perhaps changes in form with less shoe and a faster pace helped, as well. Switching to triathlon training, which has allowed me to avoid many of the training errors of my prior years of run-only training, bettering my nutritional habits in terms of post-workout recovery, and addressing my functional strength deficits have been the main components of keeping me healthy (knock on wood) in the recent years, as I've moved to longer and longer races. At the same time, I've shifted my footwear choices. Gone are the heavy, stiff motion control or stability shoes and orthotics. I remember when I first began the switch-I had won a pair of New Balance shoes at a race. When I went to the store to buy the shoes, the sales rep watched me run. Sure, my feet are flat and pronated at rest, but in motion, they hold their own a bit better. We talked a bit, I tried some neutral shoes, and I realized that they were just more comfortable. A few months after that, I bought a pair of the original Saucony Kinvara-one of the early minimalist/low heel/toe drop shoes-for my faster training/workout days and longer races. 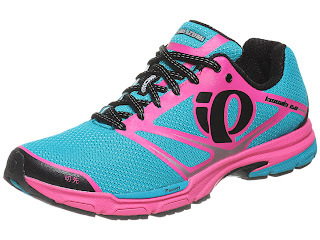 Fast forward to today, and I now train in a combination of the Kinvara (my third pair by now) and the Pearl Izumi Kissaki, which are considered a lighter weight, neutral training shoe (my current love affair with them makes me incredibly grateful to have PI as a team sponsor again this year). Although I have niggles here and there, as a whole, less shoe has done better for me than more. So, is there anything to minimalism other than the anecdotal evidence of myself and others? Does it actually encourage a better running gait, or prevent injury? Am I tempting fate by challenging conventional shoe fitting wisdom? If you imagine the graph as a mitten, the thumb region represents impact force during a typical heelstrike. Although the total force is greater as the body comes over the foot in midstance (represented by the hand region), it's thought that the rate of loading influences injury development to a greater degree than the total amount of loading-i.e. the thumb region is where the bad stuff happens. Forefoot/midfoot landing barefoot runners often eliminate this thumb region, and the graph ends up looking like a single hill, where the impact forces are lessened and occur more gradually. Theoretically (because, as mentioned above, no studies have answered this question yet), this may help decrease the risk of impact injuries such as stress fractures, knee pain, and low back pain. At the same time, barefoot runners land in a more plantarflexed (toe down) position and demonstrate greater activity in their lower leg musculature while running. So, it's been proposed that this could raise the risk of injuries such as metatarsal stress fractures and Achilles tendonitis. Stride rate and characteristics are also influenced by barefoot running. Barefoot runners take smaller, more frequent steps. Their feet spend less time on the ground (shorter ground contact time), and their legs are stiffer during stance phase, possibly allowing for greater energy return. One study also did find that barefoot runners use about 5% less energy than normally shod runners (Squadrone R, Gallozzi C Med Phys Fitness. 2009;49(1):6-13). From this data, some questions begin to arise: what about minimalist shoes? 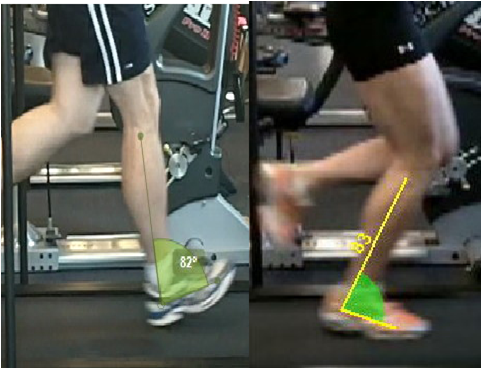 Is forefoot striking a must to reap the proposed benefits? The good news for those of us that have been running in arctic temperatures over this past week is that minimalist shoes and an increased run cadence have both been shown to have similar effects to pure barefoot running. Squadrone and Galozzi also found lower peak impact forces in minimalist shoes; barefoot and minimalist runners had similar lower limb kinematics. Heavier shoes do increase oxygen consumption (~1%/100g of shoe); however, barefoot running has not been shown to be metabolically advantageous over running in lightweight shoes (Franz JR, Wierzbinski CM, Kram R. Metabolic costs of running barefoot vs. shod: Is lighter better? Med Sci Sports Exerc. 2012 March 2). Simply put, minimalist shoes weren't shown to make you work any harder than you would barefoot. As for forefoot vs. rearfoot landing, minimalist shoes have been shown to be more economical than their standard counterparts, regardless of where on the foot the runner landed, with rearfoot vs. forefoot landing making no significance difference on economy for either shoe type (Perl DP, Daoud AL, Lieberman DE. Effects of footwear and strike type on running economy. Med Sci Sports Exerc. 2012 Jan 3). Of course, those findings dealt running economy only, not on the impact peak of rearfoot vs. forefoot running that was discussed earlier. In practice, I take foot strike with a grain of salt, focusing not necessarily on where the runner is landing on the foot, but how they're landing-I look for the shin to be close to vertical, the angle between the foot and the ground to be low, and the initial contact point to be beneath or just in front of the runner's center of gravity. 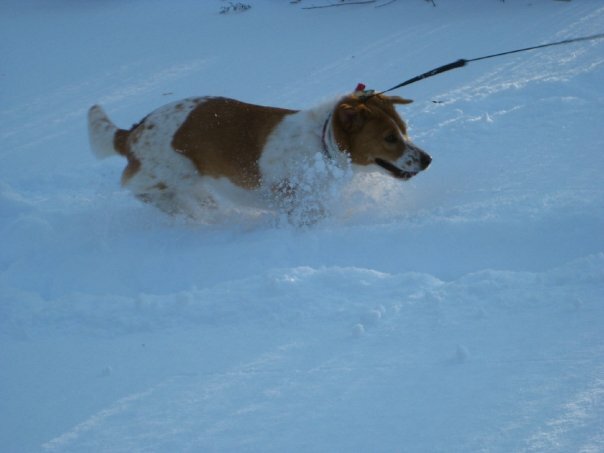 Barefoot running in the snow: fun if you're a dog. Not as great if you're a human. What about run cadence? Is it the barefoot running condition that causes decreased forces, or do the gait changes it encourages (decreased stride length and increased frequency) have that effect on their own? Researchers at the University of Wisconsin (led by Bryan Heiderscheit, who co-taught the course where I learned much of what I know regarding run mechanics) have demonstrated that simply increasing run cadence, or the number of steps taken in a minute, by 5-10% decreases lower extremity joint loading (particularly at the knee, by ~40%). Landing patterns become similar to those seen in barefoot running. 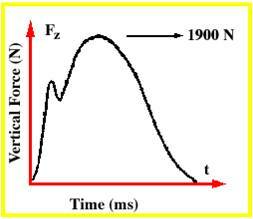 90 strides (or 180 steps)/minute has been often thrown about as the "gold standard", based upon observation of elites and some statistics about the frequency of muscle contraction. Clinically, I'm not going to take someone running at 75 strides/minute and immediately jump them up to 90; but encouraging the runner to start working towards 80-85 strides/minute is often indicated. Usually, I've also found that increasing cadence in order to encourage a better landing pattern works better than simply telling a runner to try to land differently. Having a runner tell me that they're a forefoot striker, then discovering a heavy, braking heelstrike on video is not an uncommon happening! On the left-example of a heavy, braking heelstrike. Lots of pressure up to that knee! So, as a whole, do I tell every runner who comes into our clinic to toss their shoes? Obviously not. Running injuries, footwear, and form is personal and individualized. If something was best for everyone, then the running shoe market would be pretty darn limited. As mentioned above, injury rates and location in traditionally shod, minimally shod, and barefoot runners have yet to be determined. Past research has shown that regardless of foot type, runners do best in neutral or stability shoes (minimalist shoes were not included in these studies). Basically, if the shoe is comfortable-wear it. I tend to focus more on cadence, landing pattern, and neuromuscular control and strength deficits to a greater degree than footwear, as I feel that these aspects play a far greater role in injury development than footwear does. For certain conditions, such as knee or shin pain, I do feel that there is enough evidence to possibly recommend less shoe. For others, such as plantar fasciitis, I take into consideration the other end of the spectrum, which is that orthotics (simple, OTC ones) have been shown to have benefit. Overall, I am intrigued by the idea of minimalism; less shoe has been part of the equation that has helped me personally, and I do believe that it helps to encourage better running form in most (not all!). But, for now, I'll continue to watch out for research and pass it along as best as I can, keeping a balance between the art and science of what I do on a regular basis! Hi Jennie - Longtime blog-stalker, first-time commenter here. As a scientist (molecular biologist, though) and running coach, I appreciate your analysis/thorough overview of many of the issues surrounding minimalist shoes. Although the safety/usefulness of such shoes remains an open question, I was glad to read a summary of the current literature, side-by-side with your experiences. Personally, I wear a light stability shoe and am happy with it (for now) - but I do struggle with how to handle this issue with those I coach, particularly the new runners. My current policy is for them to go get fitted at a running store for the "proper" shoe for their foot - which usually puts them in a more stable, motion-controlled shoe. I don't generally encourage minimalist shoes in new runners (who often experience lots of foot and shin issues, initially). But some coaches suggest that those who are just starting are ideal candidates for minimalist shoes, since they are already making a gradual transition to running (I use a walk/run interval method with my coachees). I'm pretty sure there's not much published on minimalism + new runners. Keeping in mind that these individuals are still figuring out their running stride and don't always have much awareness about their bodies (I do encourage "quick feet" and "a slight forward lean" - different words, same concepts you describe) - do you have any thoughts on if/how they could/should be using minimalist shoes? This far out you can use just heat if you want. If there is swelling then use 10 minutes of ice first then 10 minutes of heat. Go into any shoe store and you will see the amazing selection of running shoes available to the consumer. With so many types of Motion Control running Shoes out there, it's hard to know which ones you may need. Within the last couple of years barefoot running has become more and more popular. Barefoot running is just as it sounds: running without shoes on. Many people are partaking in this activity because of the benefits that it's supposed to have.